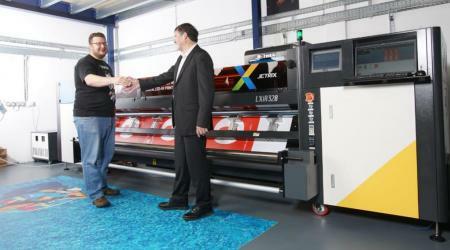 Impact Signs (N.I) Ltd recently installed a brand new EFI H1625 wide format printer for point of sale work. Belfast-based Impact Signs have really boosted their production of point of sale print and exterior signage. Read more and find out the main highlights of this machine and the benefits it can bring to your business. "With the addition of this new model, not only can we print exterior signage, we can also deliver Point of Sale and internal and exhibition graphics so we are now a complete one-stop-sign shop," says Managing Director George Smyth. 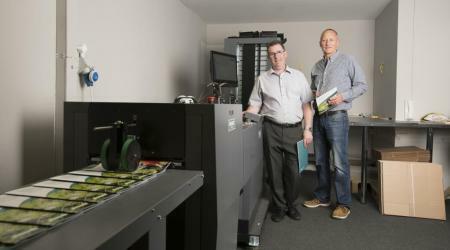 "This investment is about moving ahead of the other small to medium-sized print companies in Northern Ireland and we believe that this machine has the features that will help us to do that. For example, it features LED curing technology that is more environmentally-friendly than the traditional way of lamp curing, which uses mercury bulbs that have to be carefully disposed of and, as a result, the inks are more ecologically-friendly. The EFI H1625 prints directly onto any media, whether it is glass, perspex, wood, leather or fabrics, and it comes with four-colour plus white ink support for spot colour and under and overprinting, which gives us more print options. With some of the older printers our operators would have to go through a two-hour process to change the inks and that is now done away with. In addition, the EFI H1625 can produce ultra-fine quality prints at an affordable price. This is very important to us because we are targeting specialised markets such as interior design and more bespoke types of signage such as wallpapers. We have our own range of specialised wallpapers that we are printing onto for both commercial fit-outs and private clients. We also offer CNC routing so everything is done in-house." George describes Impact Signs as a sign company that has evolved into a digital print company in recent years. "Digital print is a growing market and we need to get our share of that market," he says. "And we believe that targeting the commercial fit-out markets with the range of speciality materials that we can print onto is the way to do that. In particular, we are looking to increase our clients in the hotel and bar fit-out sectors and also to increase the number of graphic designers that we work with." The EFI H1625 generates photographic image quality with four- and four-colour plus white at up to 42.27 square metres per hour. It is ideal for a wide range of applications, including banners, display and exhibition graphics, flags, indoor and outdoor signage, industrial-membrane switches and packaging, posters and POS materials. Typical substrates that it can print on include foam board, PVC, styrene, corrugated plastics, plywood, MDO, paper, aluminium, aluminium plastic composite, cardboard, acrylic and glass.